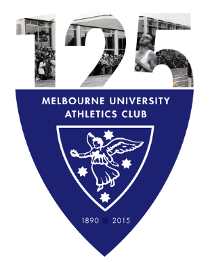 In a golden weekend for Melbourne University Athletics Club, two MUAC athletes, Jack Ingram and Jarod Pageot, have claimed national championships at the 2010 Australian Junior Athletics Championships in Sydney. 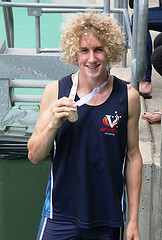 Jack Ingram took out the Under 17 Pole Vault with 4.15m, a new personal best. Jarrod Pageot won the Under 20 Long Jump, leaping 7.36m in round 5, performing well under pressure to take the gold medal. 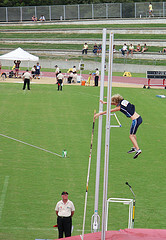 He is now closing in on 7.50m, the world junior championships qualifying standard. Jessie Layman won silver in the Under 16 Pole Vault clearing 2.60m and Emma Younger won bronze in the Under 14 Pole Vault with a leap of 1.70m. Genevieve Morris took out 5th in the Under 17 Pole Vault, jumping 2.30m. In other competition, Mitch Mackenzie jumped 1.95m in the High Jump at Rare Air Club Round 6 at Box Hill to qualify for the Australian Track and Field Championships in Perth. A big group of MUAC athletes joined in the fun at the Run 4 The Kids on Sunday. Sarah Emons run an amazing race to come 10th while David Paroissien came home in 17th.